Product prices and availability are accurate as of 2019-04-18 21:57:03 PDT and are subject to change. Any price and availability information displayed on http://www.amazon.com/ at the time of purchase will apply to the purchase of this product. This beautiful carrot grows 7-11" long and is ready for harvest in about 75 days. Very high in the anti-oxidant lycopene, which tends to be absorbed by the body at a much higher rate when the carrot is cooked. Please note: Carrots like a well-drained, friable soil. Make sure you work the soil well down to 12" and break up any clumps larger than a dime. When carrot roots grow they tend to fork when encountering clumps of soil or pebbles. I have always found the best way to grow carrots is in a raised bed, with a sandy, pulverized soil mix. 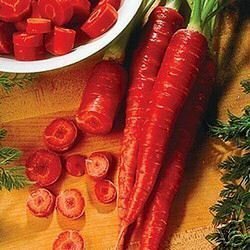 It's not necessary, but the carrots will tend to be straighter and more regular in shape.